The Rosia Montana Gold Corporation has been waiting 14 years to begin building its proposed gold mine in Rosia Montana. But on 19th November, the Romanian Senate overwhelmingly rejected the draft law that would have paved the way for the mining company to begin constructing the mine. This decision followed major protests against the mine, as well as protests in favour of it. 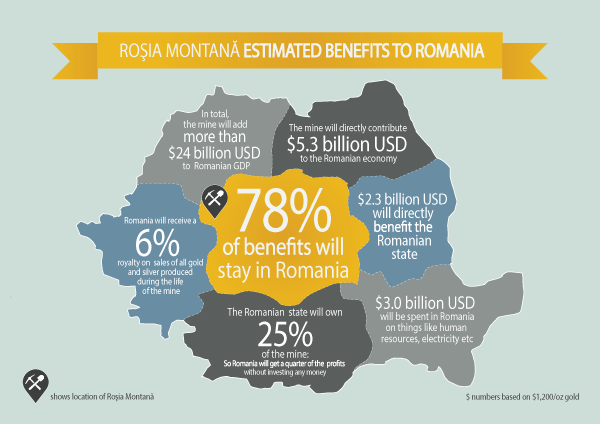 Many of the arguments promoting the mine have focused on the economic benefits it would likely bring to Romania. Currently, Romania is the second-poorest country in the European Union. A good bit of its poverty stems from the collapse of its mining sector, which was forced to shut down due to environmental concerns when Romania joined the European Union in 2006 (Many of the old mines used outdated technology that could not meet stringent EU environmental standards.). The disintegration of the mining sector led to an explosion in the unemployment rate, especially in traditional mining communities like Rosia Montana. Mining in Romania has remained dormant despite the fact that it has large mineral and metal deposits to exploit. The Rosia Montana Gold Corporation believes that its mining project will act as a bellwether for the international investing community. If it goes forward, it believes it will pave the path for more foreign direct investment into Romania, whose economy could explode because of the capital inflows. According to a report by the US think tank the Democracy Institute, Romania will gain massive economic benefits from the project in terms of both jobs and money. The company’s estimates state that the mine will create over 7,000 jobs over the course of mining operations. The company also argues that many more jobs will be created through the ripple effects of investment around the mine. The company estimates that this will turn into over US $24 billion generated for the Romanian GDP. $5.3 billion of that will go directly to the Romanian national budget, according to the company’s estimates. This revenue is derived from the taxes the company will pay and from the royalty the country will earn on gold sales. The company also argues that additional indirect benefits will come from the investment it anticipates will follow the construction of the gold mine. But critics of the project say that the project still represents a win for the mining company at the expense of the country. Particularly, many argue that the royalty rate from gold sales, which is currently set at 6 percent, is too low.